A group of dedicated midcoast residents dreamed of creating a botanical garden in Maine. The dream found its roots in an ideal Boothbay setting, and support for a garden on the coast, where horticulture, education, and research would take precedent, swelled. 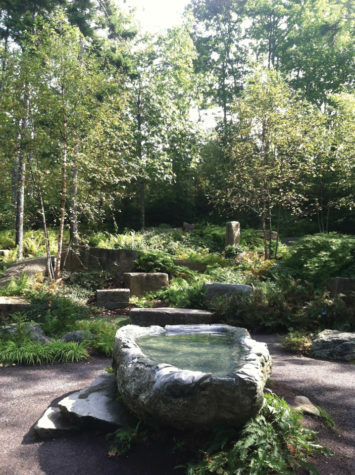 After years of planning, building awareness, planting, researching, and gardening, the Coastal Maine Botanical Gardens opened in 2007. Last year 104,000 visitors walked through the always-budding landscape, located along 270 acres of waterfront property. Among the visitors are plant enthusiasts, young learners, and seekers of a peaceful retreat. Thirty- eight thousand bulbs were planted for the 2015 season. In early summer rhododendrons and ladyslippers appear; midsummer horticulturists enjoy hydrangeas, lavender, and water lilies; and in fall pumpkins arrive and crimson and gold leaves fill the trails that weave through the property that borders the tidal Sheepscot River. With thousands of plants, plein-air artists find infinite subjects. Art exhibits rotate inside the visitor center, Bosarge Family Education Center, and Story Barn in the children’s garden. Permanent features are placed throughout the gardens, including George Sherwood’s Wind Orchid on the great lawn.